The adopt-a-trail work expected of you is relatively simple. You will need to hike your section of the trail taking shovel, shears, brush saw, and garbage bags. Along the way you will remove rock and debris from the trail, clear drainage dips/water bars, cut or move small downed logs, trim brush, and remove litter. 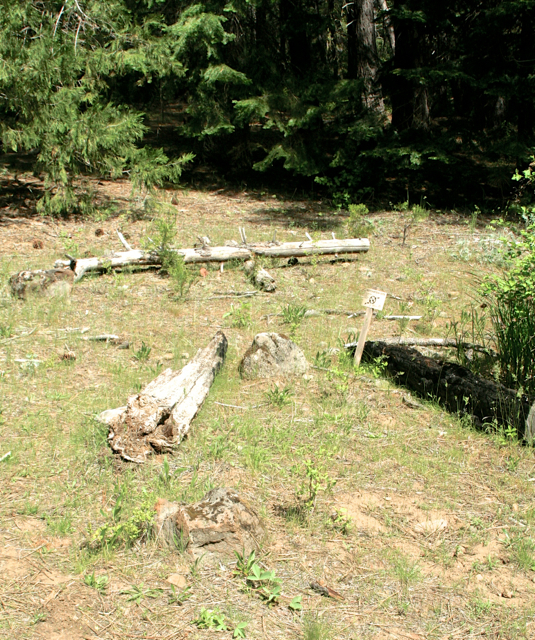 In addition, the Forest Service needs to know about the need for more extensive work. A report form is provided to report larger jobs and to note problems. Trails are to be cleared of downed material. Material is to be completely removed from the trail so that it will not roll back onto the trail. Brush along the trail should be cut off at the ground level so that it does not protrude into the trail. Branches protruding in the travel way should be pruned back to the trunk of the tree to a height of 10 feet so that a person on horseback or on a bike will not hit the branch. 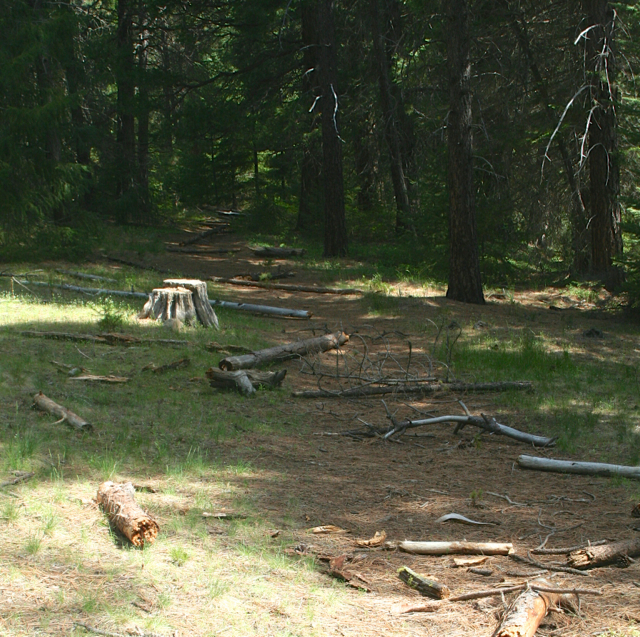 All material should be scattered randomly along the downhill side of the trail. 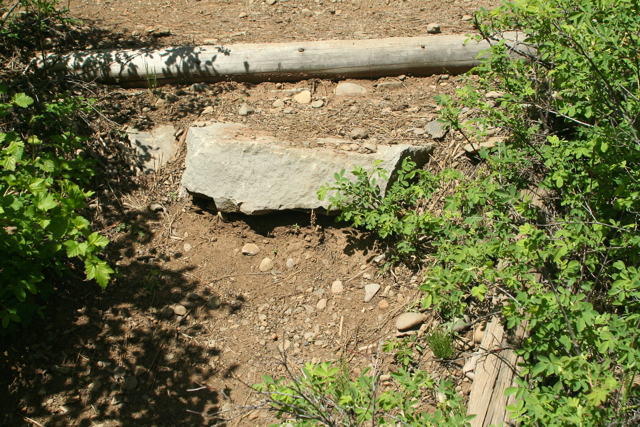 Clean drainage dips/water bars (erosion control structures) by removing the soil that has accumulated on the uphill side of the structure and allowing water to flow from the trail to undisturbed ground. If erosion is serious and new rock or log waterbars/drainage dip need to be installed please note on the trail maintenance report. 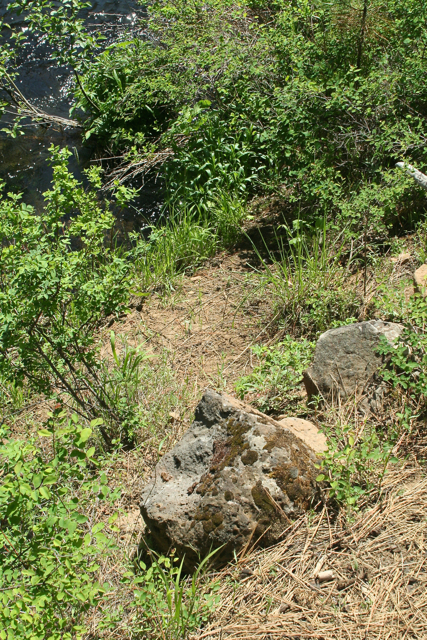 Examine all trail signs along the trail and note any repair or replacement needs. If a marker is leaning or on the ground, straighten and tamp securely in place. Any small trees that are growing in the trail or right along side may be removed. Pull roots and all if you can or cut off at ground level. 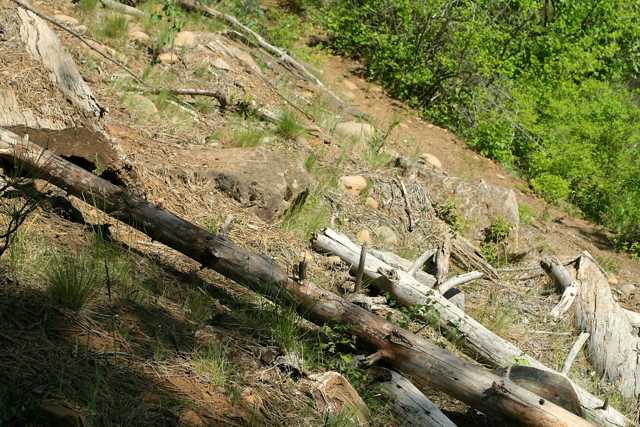 Submit the Trail Maintenance Report each time you work your trail. Plan to work your trail at least twice during the dry months, once at the beginning of the season as the trail becomes walk-able and once later in the summer. 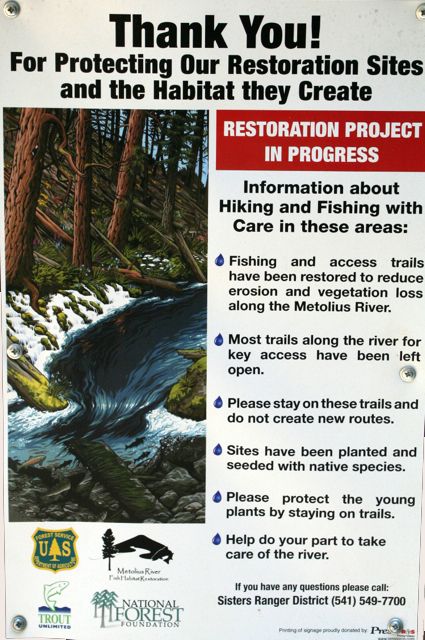 Trail and stream-side restoration work along the Metolius has been provided by Trout Unlimited and the Deschutes National Forest. Work on the project began in Fall, 2011 and the final sites are scheduled to be finished in 2015. Friends has agreed to help monitor restoration sites as part of our Adopt-a-Trail program. Darek Staab of Trout Unlimited led a walk in early May, 2014 that included ten of our thirty Adopt-a-Trail volunteers for the year. He acquainted us with the work that has been done and identified specific aspects of the work that we need to keep an eye on. 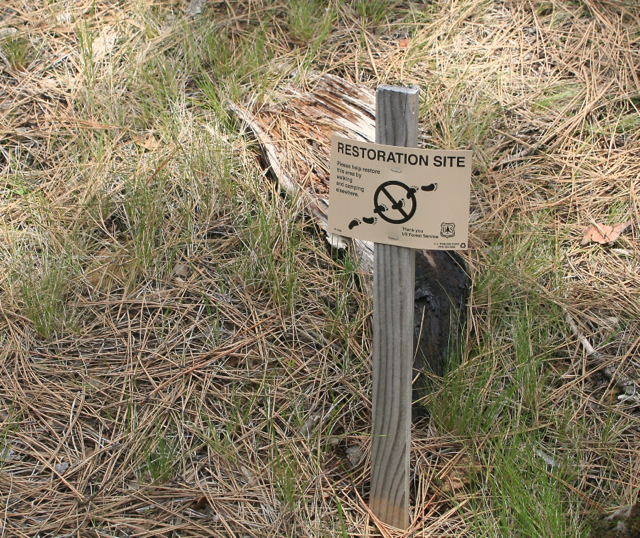 You will find signage at each restoration site. Check to see that restoration work is identified well and note where an additional sign might be helpful. Repair any damaged signs. 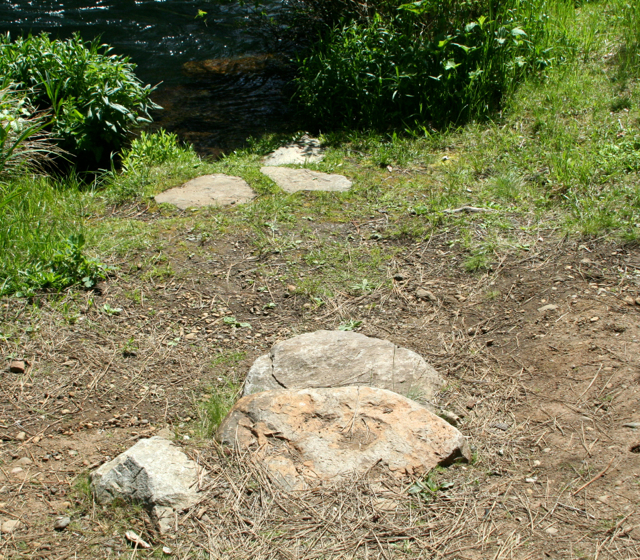 Ideally, grasses and other vegetation should be growing in around rock placements. Note where the wear and tear of foot traffic is excessive and this is not happening. You will find new plantings at all restoration sites. Check their health and note any concerning trends and problems with plant health. Restoration projects often lose a percentage of plants, but we are interested if plants are getting trampled and large scale problems with a planting. New plantings and woody debris have been placed to obscure old foot paths. Note instances where this doesn’t seem to be working and old paths are being remade and debris thrown aside. Don’t hesitate to replace wood. Check the health of areas adjacent to clearly marked trails and note areas where heavy impact is evident. Rocks, logs, and new plants have been placed to discourage sliding down steep embankments and to prevent resulting erosion. Note locations where this doen’t seem to be working. 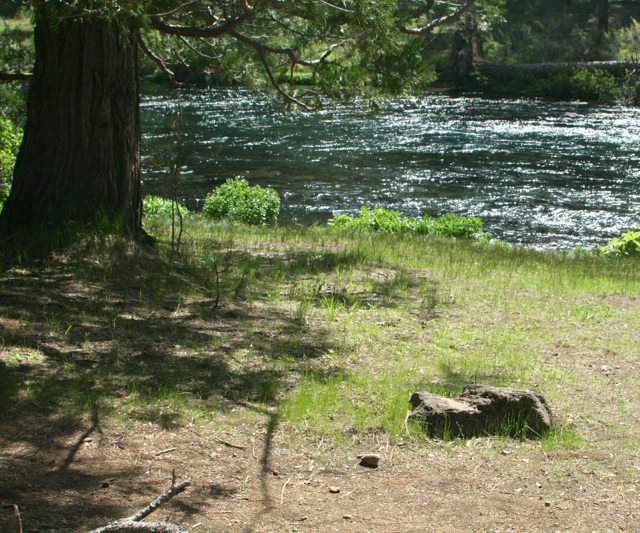 Note any any new user created side trails to the river that seem to be developing. Go ahead and place some woody debris to discourage further use. High water or heavy rain, and the resulting erosion, can undercut rocks which were placed — as seen here. We are especially concerned if rock placement has failed and is dangerously loose or lost. Note where this seems to be happening. Your experience should be enjoyable, but also safe. Safety does not spoil the fun, but accidents do. Part of Friends commitment to the Forest Service in putting together this adopt-a-trail program is to make sure that you are aware of various safety issues. Please review the attached Forest Service safety guidelines each time you set out to work and, please, work safely!